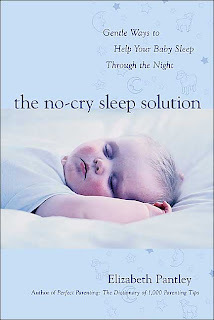 Hollyn’s friend, Jennifer, kindly mailed me her copy of The No-Cry Sleep Solution book. She enclosed a handwritten note (great penmanship, by the way!) saying, “Good Luck! Chapter 4 is the one to read if you want the quick read”. I thumbed through the first three chapters. They contained basic safety information about your child’s sleep environment, the basics on your child’s sleep cycle and then a chapter on “sleep logs”. The vast majority of it was stuff that I’ve previously read in other resources, so I have to admit that I wasn’t the most diligent study on Chapters 1-3. I was guilty of doing this. At the first noise Cara would make, I would pull her to my breast for fear she would awaken. She would “nurse” for a minute or two and then drift off back to sleep. I finally realized that I was teaching her to nurse more frequently at night. I was actually reinforcing a behavior that eventually got out of hand. I have to say that this passage offended me. I’m a stay-at-home mom; my “job” is my daughter. I totally enjoy breastfeeding her and relish our time together when she’s nursing. BUT, both of us need sleep. Waking every hour at night to nurse is not healthy for either of us. Not only does she take in way more calories than she needs, she’s also not progressing through the necessary sleep stages. This, in my opinion, can be a very valid way of transitioning your baby into their crib. In fact, that’s how I did it with Caroline. When she was very young, from birth until around four months, I would swaddle the crap out of her and nurse her to sleep. Once she was completely asleep, I would move her to her pack-n-play. Occasionally, she would stay in bed with us. But, once she hit four months, she had exceeded the weight limit for the bassinet part of the pack-n-play. Since the lower part of the pack-n-play was uncomfortable for her, I began taking her into her room and placing her in her crib. When she would awaken in the night, I would lay on a pallet on the floor with her and nurse her back to sleep. It worked great…until it didn’t. Maybe it was her age or maybe it was her personality or a combination of both. But, our nighttime nursing steadily increase until it became quite apparent that she couldn’t go back to sleep without nursing. So, while this might work for some, it quit working for us. From what I saw when I was thumbing through the book, The No-Cry Sleep Solution is basically a “gentler” version of Dr. Ferber’s book. Both Elizabeth Pantley and Dr. Ferber advocate schedules; Pantley calls them routines as Dr. Sears does and Dr. Ferber calls a spade a spade. Both advocate an early bedtime for infants and toddlers. Both books explain sleep cycles; Pantley’s explanation is wonderful for a lay person while Dr. Ferber’s is just what you would expect from a doctor…scientific. Both books come with a “plan” and a promise; Pantley has a ten day program while Ferber’s is seven days. One thing that I like about Pantley’s book that Dr. Ferber’s is sorely missing is “Part II – Let’s Talk About You”. This section deals with issues that mothers have with sleep once the child is sleeping (happened to me) and common fears and concerns that ALL moms have. There is also a brief list of web sites that Pantley finds helpful.